Justin and I have been talking about a spring break trip since school started last August. We weren't sure what we were going to do but we knew we wanted to do something since it would be the boys' first real spring break together. They were now at the same location, with the same week off and we didn't want to let that go by without doing something special. I threw out the cruise idea. Justin was open but wanted me to do a little more research. I did and in November we booked our trip. This would be the first REAL vacation that the 4 of us would be taking. 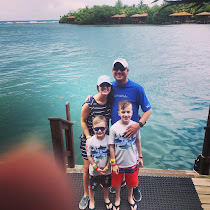 Every prior vacation included family in one way or another---don't get me wrong, I wouldn't change those family trips for anything as they were perfect in every way this was just different and perfect in every way too. We decided to port of of New Orleans. We decided that since we would board the ship on Sunday, March 12th that we would take an early flight out of KC on Saturday, March 11th and enjoy a little time in NOLA. After all, it was the Saturday before St. Patrick's Day and celebrations would be held and well, you know we have a soft spot for St. Patrick's Day celebrations. We hopped in an Uber & thanks to recommendations had a booster ready to go with Logan. We purchased one of the Bubblebum Inflatable Booster and as had it packed on top of his suitcase so as soon as we landed, I blew it up and we were ready to go. Passes all safety guidelines in case you are wondering. & now we have one in case anyone needs to borrow. We arrived at a very charming hotel in the French Quarter and dropped our luggage, after all it was like 9 in the morning and rooms were ready quite yet. 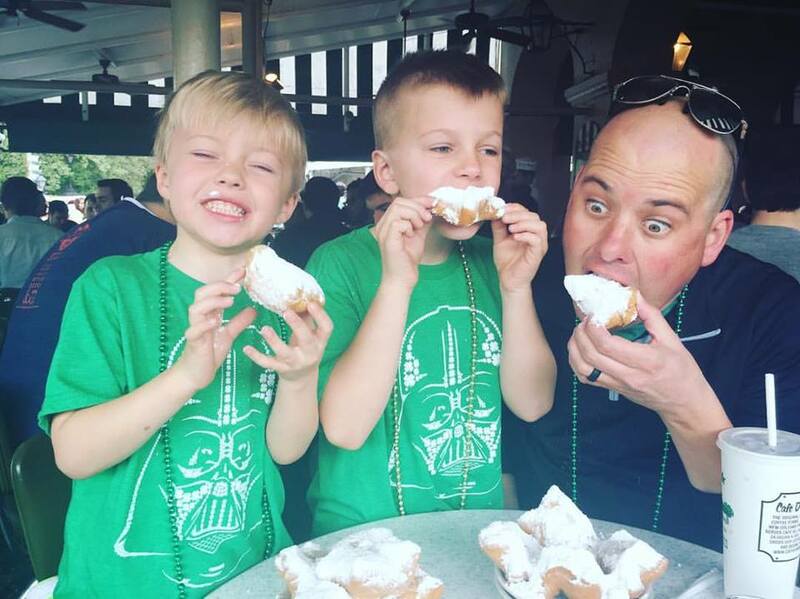 So we took to the sidewalks and headed straight for Cafe Du Monde to try their famous beignets. The line was long but they were so worth the wait...a light warm donut like pastry doused in powdered sugar. Across the street from Cafe Du Monde was the park area & street vendors were out in large numbers. As we made our way around the boys got their first henna tattoos---keeping still for both boys proved to be quite the challenge. 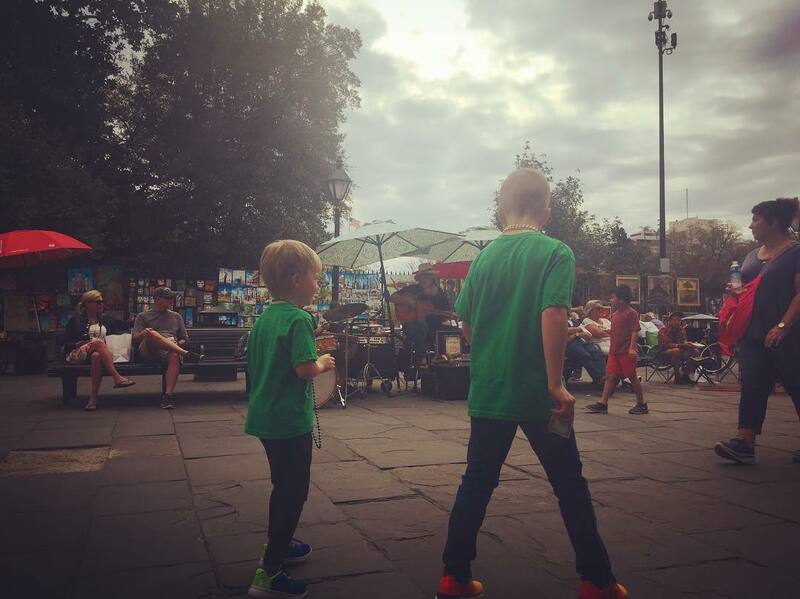 We continued to make our way around the open market and came up to a wonderful band who got the boys to stop in their tracks and groove a little before wanting to move on. One of their favorite things to do when at something like this is to tip the entertainers so Justin and I make sure that we have plenty of cash on hand. After moving on from the live music we took part in a street performers magic show, he was one of the most entertaining people I have seen perform. Check him out at Magician On A Motorcycle. For lunch we hit up another local favorite-Mother's, known for their "world's best baked ham." I didn't have the ham but the chicken and waffles that I did have were delicious. And can I just ask---what is it about bunny ears. They are in EVERY. SINGLE. PICTURE. now. For dinner we found another local eatery and just gave it a go. The boys enjoyed it. Justin enjoyed it until apple juice was poured all over him and he forgot his jambalaya on the table. He was really looking forward to having it a little later in the room. While we waited for food we took a few pictures of the kiddos, mainly because Logan's pupils were sooooo big, they may not look all that big in this picture but compared to how small they were earlier in the day it was unreal. And seriously, could the kid be any cuter. 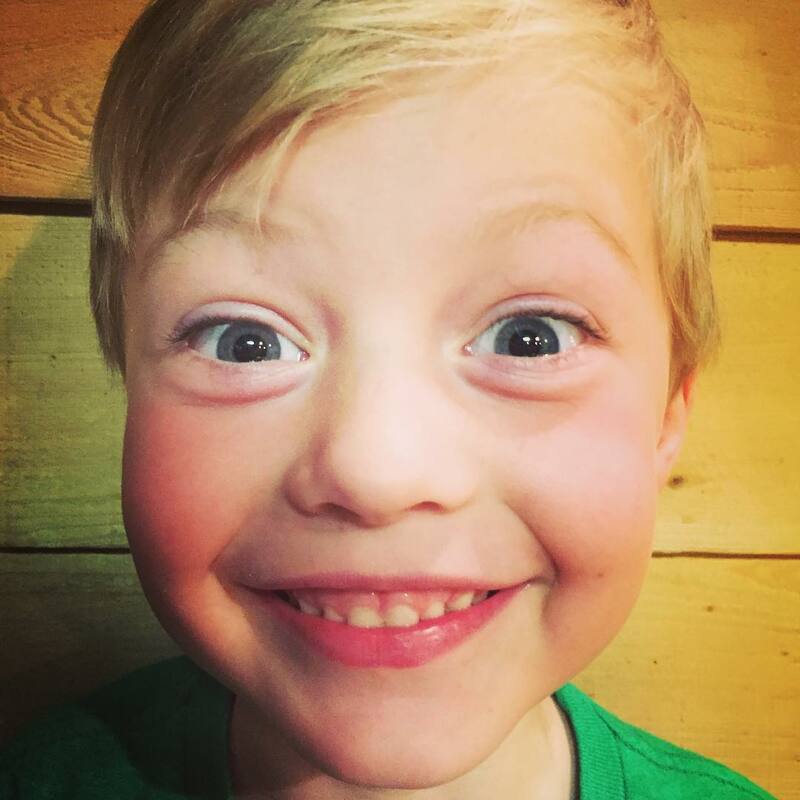 Then there is Kaden with his awesome smile---hopefully soon those teeth will straighten out. It took no time at all for Kaden to fall asleep, Logan had taken a little nap and was up a little later but by 9 o'clock it was lights out for all--our BIG adventure was only hours away and the boys still had no idea what was happening. *This was the first time that we had allowed the boys to take their own luggage. 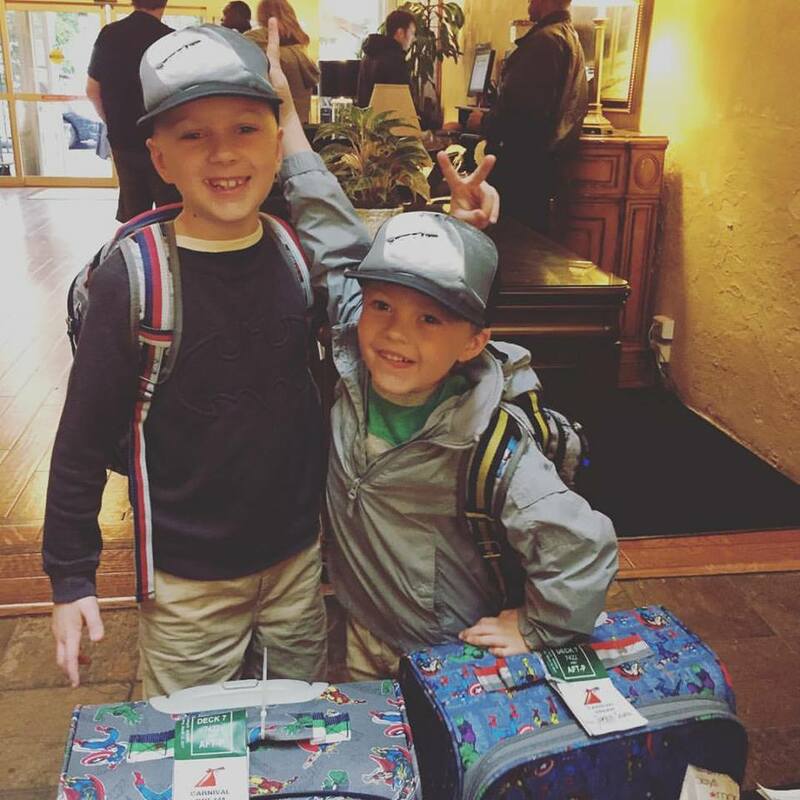 Partly because they had been asking for their own suitcases and Pottery Barn had a good sale during the holidays and partly because Kaden's clothes are just too big and don't fit in with ours. We use to be able to pack all four of us in two or three bags, not now. Of course they thought they were pretty cool pulling their own bags & having superhero bags helped identify them much quicker.